Dep. Mike Scalley participates in a training exercise during the International Police Mountain Bike Association Conference last week. The first Delaware County Sheriff’s deputies to be certified as bike officers at the Delaware County Fairgrounds last week. From left to right, deputies Mike Scalley, Troy Ellis, and Josh Clarke. 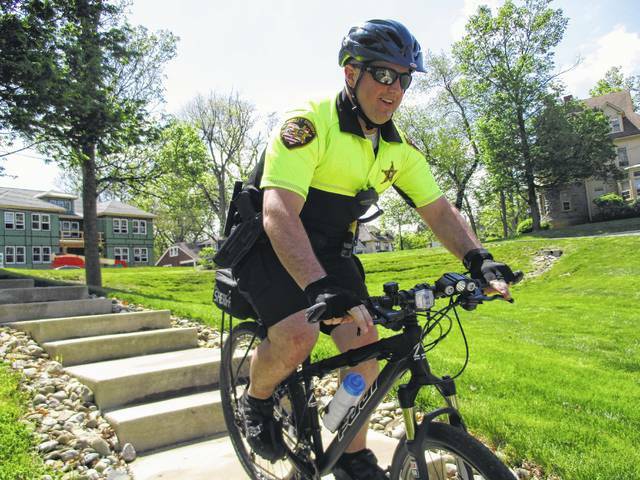 The Delaware County Sheriff’s Office now has three deputies trained as bike officers. Delaware County sheriff’s deputies Mike Scalley, Troy Ellis, and Josh Clarke participated in the International Police Mountain Bike Association Conference last week and completed training courses and exercises to become certified mountain bike patrol officers. Capt. 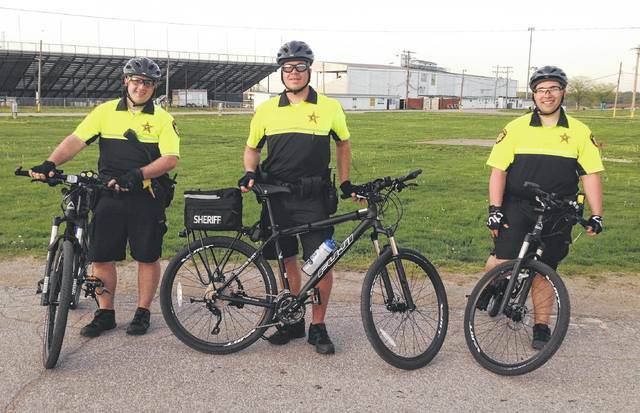 Scott Vance of the Delaware County Sheriff’s Office Patrol Division said the three deputies are the law enforcement agency’s first bike officers. He said the move has been considered for a while. “It’s a natural progression,” Vance said. Vance said that the three deputies will use the bikes to patrol residential areas or business districts in the county. “[On the bikes] they can interact with the public and are easily accessible. A bike can go places a car can’t. It adds versatility for the deputy,” he noted. Vance said the officers will also be used to patrol events like the Delaware County Fair or other special events where a mobile deputy would be useful. Vance said the three deputies will keep the bikes on their vehicles and will patrol on them, as long as they aren’t dispatched to something else. The addition of a mountain bike unit has been a vision of Delaware County Sheriff Russell Martin, Vance said. He stated that the sheriff hopes to increase the number of bike officers in the future. Vance added that the sheriff’s office is treating Scalley, Ellis, and Clarke as the pilots of the bike program and will be working with them to determine the best use for a mountain bike unit. During the IPMBA conference, officers were taught how to handle a large variety of situations, including using the bike to travel slowly through large crowds and how to use the bike to deal with a violent situation. The Delaware County deputies were just three of more than 300 officers that participated in the conference. The sheriff’s office joins the City of Delaware Police Department, which has had a bike unit since the mid-1990s. City of Delaware Police Captain Adam Moore said the police department has approximately 14 bike officers. Moore said the police department hosts a bike training school every year and said Delaware Police instructors helped train the sheriff’s bike unit last week. https://www.delgazette.com/wp-content/uploads/sites/40/2017/06/web1_IMG_0356.jpgDep. Mike Scalley participates in a training exercise during the International Police Mountain Bike Association Conference last week. https://www.delgazette.com/wp-content/uploads/sites/40/2017/06/web1_IMG_2678.jpgThe first Delaware County Sheriff’s deputies to be certified as bike officers at the Delaware County Fairgrounds last week. From left to right, deputies Mike Scalley, Troy Ellis, and Josh Clarke.